Tuesday, June 30 at 7:00 p.m.
Wednesday, July 1 at 7:00 p.m. In the spring of 1964, the Nankai Hawks of Japan’s Pacific League sent 19-year-old Masanori Murakami to the Class A Fresno Giants to improve his skills. To nearly everybody’s surprise, Murakami, known as Mashi, dominated the American hitters. With the San Francisco Giants embattled in a close pennant race and desperate for a left-handed reliever, Murakami was called up to join the Big League club – becoming the first Japanese to play in the Major Leagues. Recognizing his pinpoint control and devastating curveball, the Giants offered him a contract for the 1965 season. There was just one problem – the Nankai Hawks still owned his contract. The dispute over Murakami’s contract would ignite an international incident that ultimately prevented other Japanese from joining the Majors for 30 years. Mashi: The Unfulfilled Baseball Dreams of Masanori Murakami Japan’s First Major Leaguer by Robert Fitts is the story of an unlikely hero who gets caught up in a clash between American and Japanese baseball and is forced to choose between fulfilling his dreams in the United States or fulfilling his duty in Japan – a decision that he regrets to this day. 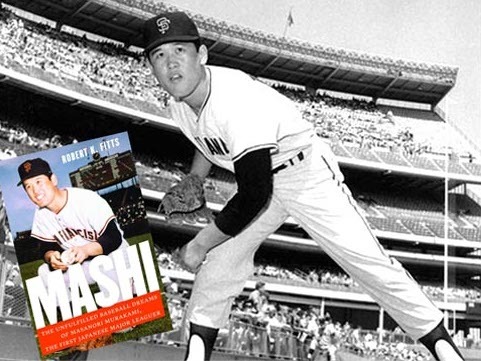 Join Masanori Murakami, author Robert Fitts, and filmmaker Yuriko Gamo Romer at Barnes & Noble on June 30 and Bergino on July 1 for a discussion on Japanese baseball and Mashi’s role as Japan’s first Major Leaguer. Afterwards, Mashi will meet with fans and sign copies of his new biography. Only books purchased at each night’s location will be signed. Copies of the book as well as autographed balls and cards will be on sale at Bergino. RSVP to the event at Bergino by visiting Eventbrite.